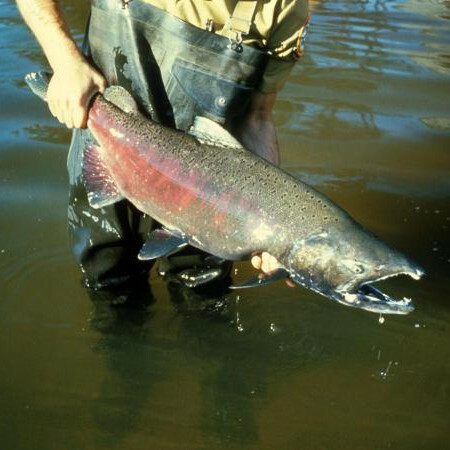 Chinook Salmon – The King of the West Coast Waters! Huge Chinook salmon easily top the list of all the trophy fish that recreational fishermen dream of catching. With normal sizes ranging between 20 and 30 pounds and true trophy fish weighing in in the 60 pound range coupled with incredible power Chinook salmon are some of the hardest fighting fish you can hope to lay hooks into. In Puget Sound trolling for Chinook salmon is the most common method of catching big Chinook. There are some secrets and tips that will greatly increase your chances of success when it comes to boating a Chinook salmon. Timing and location is key when trolling for Chinook salmon. It is senseless to spend hours on the water and gallons of fuel trolling when the fish just plain aren’t ‘in yet’. One good method to track the progress of Chinook as they migrate is to keep track of your local fishing boards and tackle shops and what is happening. Additionally, knowing where the Chinook will be when they do arrive is essential. Chinook like most salmon will have specific areas that they congregate in before moving to the rivers to spawn. These are the spots you should focus your attention on. Pay close attention to your speed and direction you’re trolling. Salmon typically will try and keep their noses pointed upstream when given a choice. This allows them to zero and on prey both by sight and scent. You can use this to your advantage by trolling with the flow of the tide whenever possible. This increases the amount of time the Chinook have too see, feel and smell your lure and react to it. Bucktail trolling flies can be deadly for Chinook Salmon! Match the size and color of the area bait fish for best results. ‘Match the hatch’ to catch more and bigger Chinook salmon. 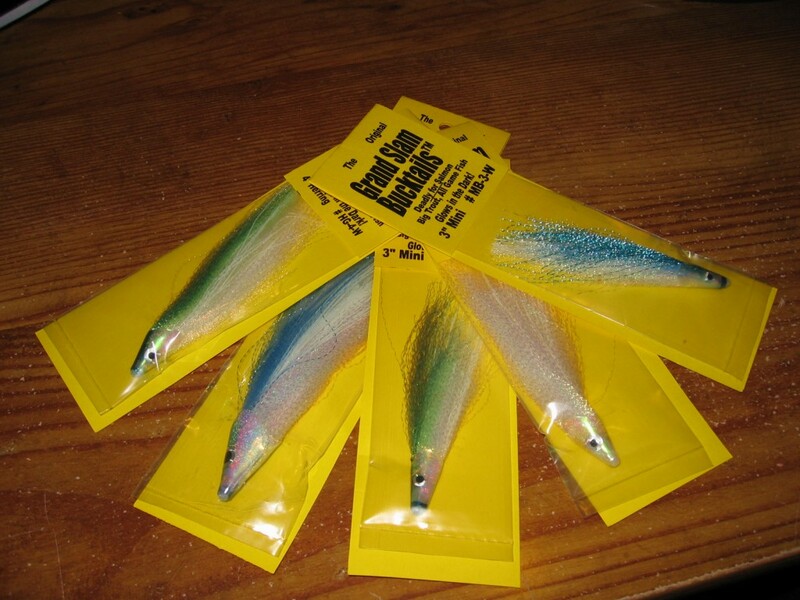 While it is true that you may catch Chinook on any given lure on any given day, presenting them with a lure that looks like what they are feeding on both in size and color will greatly increase the chances they will bite. Quite often salmon will follow a lure for some distance before deciding to truly eat it. Your choice of hooks can greatly affect your success rate when fishing for Chinook salmon. Pay special attention to the hooks that come pre-rigged on lures as they are often times of poor quality and dull right out of the box. The same can be said for pre-tied herring rigs. Oftentimes you only get one or two chances for a hook set when a Chinook attacks your lure, having sharp high quality looks will increase your odds that when they bite that the hooks will stick. Scent plays a big factor when fishing for Chinook salmon. When you are trolling for Chinook salmon, they will follow the scent trail your lures leave. This means you have to be aware of both the scent that you want and don’t want them to smell coming off your lures. Lures have to be free of smells that will turn the fish off such as grease, gasoline, and even oil from your own fingers. Cleanliness is a must! Giving your lures a positive scent is definitely part of a successful Chinook salmon fishing trip. Liberally applying sent your lures helps ring in the dinner bell and entice them to bite. When fishing for Chinook salmon you must know how deep to go. Chinook salmon are not afraid to go deep, love to feed off small bottom fish, and will only rarely be found at a ‘suspended’ depth. In most cases to be very successful at Chinook salmon fishing you need to do what we call ‘Knuckle Dragging’. This means that you must keep your downrigger right on the bottom. The goal is to keep your lure in the bottom 5 feet of the water column where they are feeding when trolling for Chinook salmon. Don’t be afraid to think outside the box when Chinook salmon fishing. Just because everyone and their cousin is fishing in particular bar doesn’t mean that is the best place for you. Look for other holding areas that other people may have overlooked or that are receiving less pressure. This may mean that you are targeting fewer fish, but fish that are more receptive to your presentation. Chinook salmon fishing like anything else takes practice and experience. Keep records of what fishing top of what lures, where and what depth. Don’t be afraid to ask questions on fishing boards and at the local tackle shops to find out what has been working for other people. While it is always good to test out new lures and techniques, it is a good idea to start with the ‘standard lures’ to begin fishing with. With time you’ll learn what lures and techniques work best for you and will put the most Chinook salmon in your boat.